Bellingham Marine collaborates with The BoatYard at Marina del Rey to expand service offerings for boats in Southern California. Marina del Rey, California, USA – 11 October 2018 – Big boats mean big money. They also mean big equipment when it comes to repairs. Large vessels often have trouble finding boatyards in Southern California that are capable of servicing them, until now. 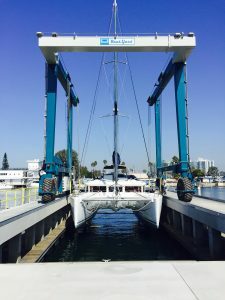 Boat owners in the region have a new option with the installation of a 100-ton travel lift pier at the The BoatYard at Marina del Rey. The new Marine Travelift has opened up The BoatYard to a much larger market. From fishing boats to catamarans, there is a local demand for a machine of this stature. The three new travelift piers have 35-ton, 100-ton and 135-ton capacities enabling the marina to service large fishing vessels and catamarans. The lift sits on one of three new fixed concrete piers built by Bellingham Marine. The piers have 35 ton, 100 ton, and 135 ton capacities. In addition, Bellingham built the new 114-slip marina. Included are new concrete floating docks, aluminum gangways, and modern dockside utilities. The majority of the existing concrete guide pile are still in use. Construction took place in phases, one dock at a time. This allowed the majority of boaters to stay in the marina during construction. Staying open means the marina can keep current tenants and sustain cash flow. “Every project is unique and we work hard to make the transition as smooth as possible for our clients,” said Eric Noegel, manager of project development for Bellingham Marine. The BoatYard at Marina del Rey is a full-service boat repair yard and marina. It provides customers with a one-stop shop to handle all of their boating needs. Bellingham Marine is the world’s leading marina design-build construction company. The company specializes in floating docks, platforms and wave attenuation systems for marinas worldwide. Visit www.bellingham-marine.com for more information.